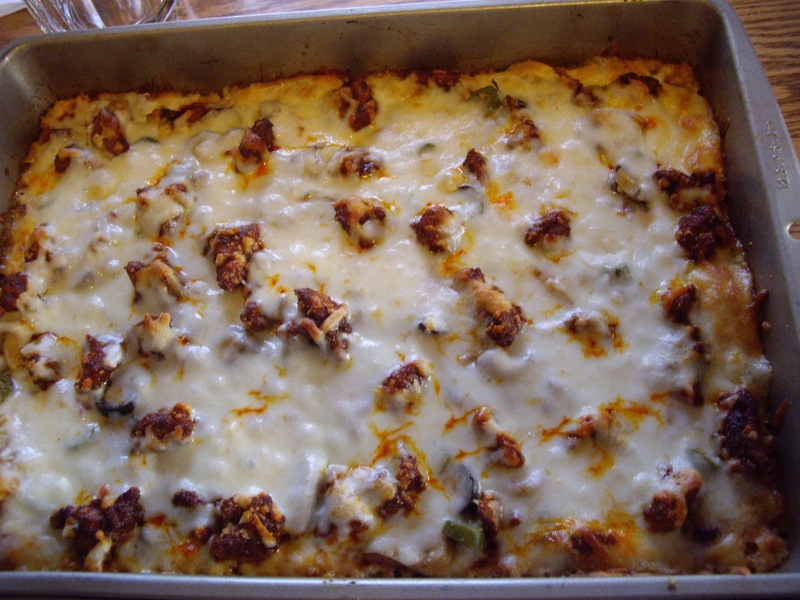 Pizza chicken is a tasty low carb and gluten free way to enjoy pizza. Is it just like eating pizza? Of course not. But it is pretty awesome! Prep time is about 10-15 minutes and cook time is about 30-35 minutes. Cut up your chicken. The larger the pieces, the longer it takes to cook. Set aside. Pour half of the sauce into the baking pan. Top with the chicken. Add whatever you want for additional toppings. Cover with the rest of the sauce and sprinkle the cheese over the top. Bake for 30 minutes and check a piece of chicken to make sure it is done. If not, let it cook a sew more minutes. If you want more color to your cheese, turn it up the last few minutes to brown it a little. A thinner sauce will still taste good. But, you will have the juices from the chicken mixing with the sauce and thin it more so a thicker sauce to start out with will work better. This will serve 6 good size portions. This isn’t your ordinary eat with your hands pizza.You will need a fork. It got it’s name from my daughter. I came up with the food and she called it pizza cause it tasted that way. I love quinoa and use it whenever I get the chance. You will need a 9″x13″ baking pan. 2 to 3 cups shredded mozzarella cheese. Rinse the quinoa in water if it is not pre-rinsed. In a large pan with lid, add the water and salt it. Stir in the quinoa and bring to a boil. Lower the heat and cover. Cook until water is absorbed, about 20 minutes. Stir in the egg and Parmesan cheese. Spread into the bottom of your baking dish. Spread the pizza sauce over the quinoa. Sprinkle with your pizza toppings. Bake for 15 to 20 minutes until cheese is melted and bubbly. Take out and let stand for a few minutes. I usually get 12 to 15 pieces out of this. This is a great pizza. It’s a favorite in my house. Instead of the traditional tomato sauce, you use salsa. You will need an 11″x15″ jelly roll pan, greased. Preheat your oven to 425 degrees Fahrenheit/220 Celsius. 1 cup sliced red peppers- If you don’t have red, just use an additional cup of green. 1 cup salsa- Use whatever heat you prefer. Bake the crust for 6-8 minutes. Saute the chicken in the cooking oil until no longer pink. Add the onions and peppers. Sprinkle with the chili powder, cumin, garlic powder, and salt. Stir and let cook until the onions and peppers are tender. This will take about 5 minutes. 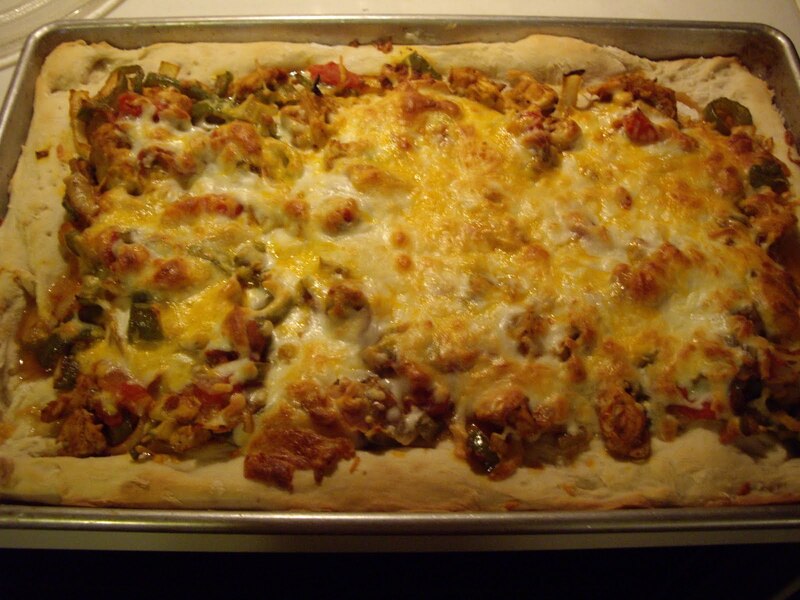 Spoon the chicken and vegetable mixture over the hot pizza crust. Bake in the preheated oven for another 15 minutes or until the crust is golden and the cheese is melted. Serve. This is enough for 4-6 people. If you want, you can make 2- 12″ round pizzas using the same amount of crust and dividing the toppings between the two crusts. Homemade pizza is great! You get to put on how much of what toppings you want. For this pizza, I decided to try my hand at a cheesesteak pizza. 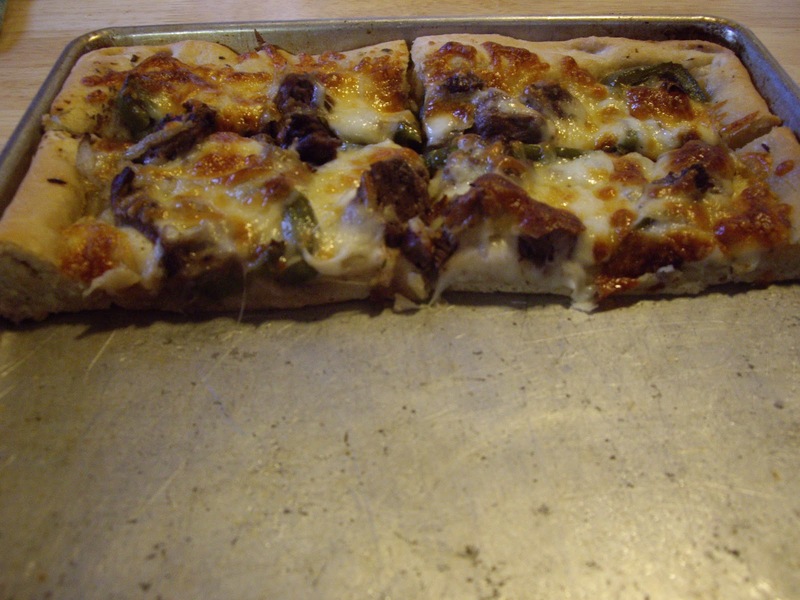 Razor thin and tender meat, green peppers and onions topped with cheese all on a pizza crust. Yummy! You will need an 11″x15″ baking pan OR a 16″ round pizza pan. 1/2 pound thinly( approx. 1/8 ” thick) sliced beef. I used loin, but choose what kind you prefer. Prepare the crust and set aside to rest. Heat a small amount of oil in a skillet.Medium heat is good. Add the sliced meat and season with salt and pepper. Cook for a few minutes until meat is browned. Add the peppers and onions and cook until they are tender. Stir a couple times so they won’t scorch. Set that off the heat. In a small pan, melt the butter and add in the oregano, basil, garlic powder,and onion powder. When melted and mixed in, remove from the heat. Grease your baking pan and press the dough into it. Build up the edges slightly. Preheat your oven to 425 degrees Fahrenheit /220 degrees Celsius. Brush the butter/herb mixture of the pizza dough. A pastry brush is great, but a large spoon will work. Spread the meat/veggies over that. Bake for about 15 minutes or until the cheese is starting to brown and the crust is golden. Remove from the oven and let it set for a few minutes to make for easier cutting. 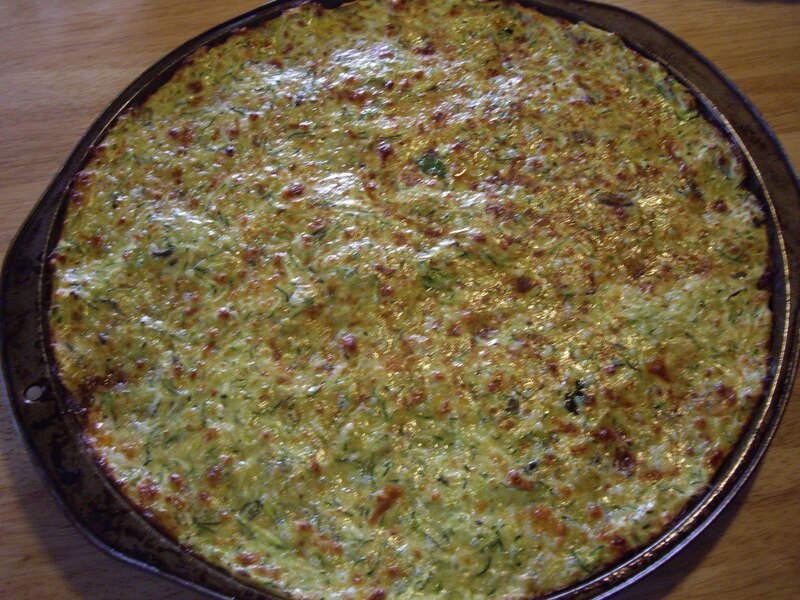 This is another great way to use up zucchini. If you want to make it gluten free, use soy or oat flour. I did find this on a recipe website many years ago. That website is no longer around. But, this fabulous recipe is. You will need a medium size(12-14″) pizza pan that is very well greased. Grease well or the crust sticks in the pan. In a large bowl, salt the zucchini and let stand about 15 minutes to draw out moisture. Drain and squeeze out as much excess moisture as you can. Add the rest of the ingredients- except oil- and stir until combined well. Spread the mixture onto the greased pizza pan. Bake for 25 minutes or til the surface is dry and firm. Remove from oven and turn oven to broil. Brush oil over the surface of the crust. Stick under broiler for a few minutes just to brown. Watch closely so it doesn’t get too dark. To make pizza, add whatever toppings you like and bake an additional 20 minutes at 350 degrees Fahrenheit. Let stand 5-10 minutes before cutting and serving. I love this pizza. I first had this variety as a frozen pizza. I decided to see if I could make my own version and this is it. Just as the name says it has chicken, bacon, and Alfredo sauce. You will need a greased 11″x15″ baking pan. Bake in a preheated 425 degree Fahrenheit oven. Cook your chicken and bacon and set aside. Make your pizza crust and pat it out into your greased pan. To make the sauce, you need a small saucepan. Melt the butter and add the garlic powder, salt, pepper, and flour. Quickly add the milk and stir constantly until the sauce thickens and bubbles. Cook and stir for a minute. Turn off heat and add the Parmesan cheese. Blend in well til as smooth as you can get it. Spread the sauce over the crust. Sprinkle the mozzarella cheese over the sauce. Add the chicken and bacon. 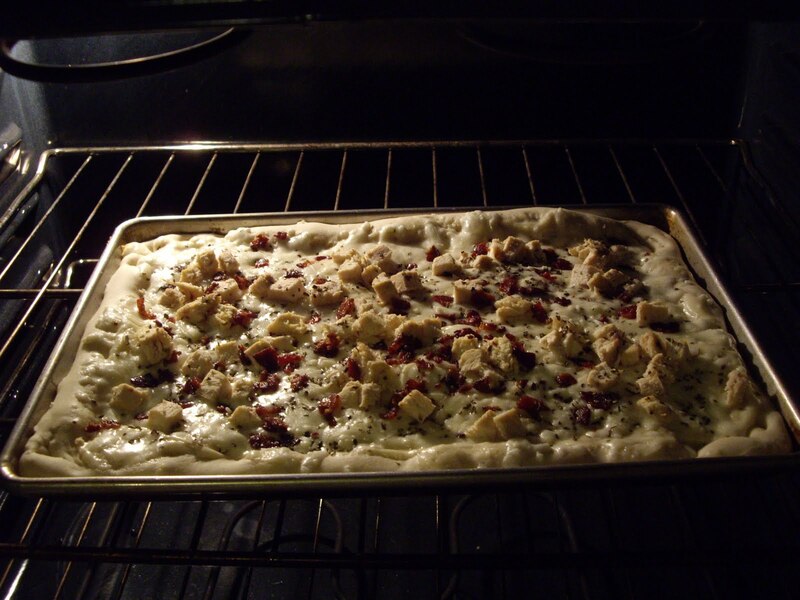 Bake in the preheated oven for 15- 20 minutes until the crust is just starting to brown and the cheese is melted.